Today is officially the first day of Fall. Does that fact make you happy or sad? If like me, you wish you could hold on to the fun of summer parties and outdoor festivities just a little longer, I know a yummy, cheap way to do it. But let me first tell you a little story. About six months ago, I was shopping the endcaps of my local Target store, looking for bargains, when I happened upon a great find. I was in the food section when I noticed some colorful pouches sitting on a shelf. 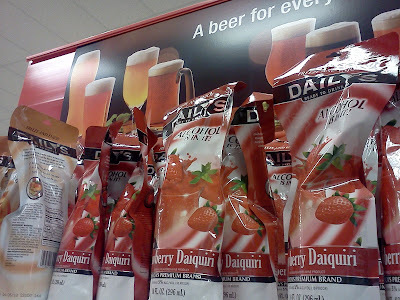 I picked one up and found out they were Daily's Cocktail Frozen Pouch Drinks. I figured they were probably just cocktail drink mix in a pouch until I read the label and found out they contain not just the cocktail drink mix, but also the alcohol. All you have to do with these Daily's Frozen Pouches is freeze, pour the contains into your favorite margarita glass, and enjoy! With Daily's Frozen Pouches, you don't need a blender. You only need a freezer and a glass. And get this, you get all this goodness for between $1.99 - $2.99 per pouch, depending on the store where you buy them. As I stood in Target that day with a Daily's Frozen Pouch in my hand, I figured I had nothing to lose for only $1.99 so I decided to try one in each flavor. I bought Strawberry Daiquiri, Frozen Margarita, Frozen Lemonade, Pina Colada, and the Peach Daiquiri flavors and took them home to put them in my freezer. The first flavor I tried was the Strawberry Daiquiri - and yes, it tasted just like a frozen strawberry daiquiri that would buy at a club or restaurant. And I loved that all I had to do was run the pouch under warm water, squeeze the pouch to break up the ice, snip off the top with scissors and pour the contents into a glass. How easy is that? Over the next month, I tried one flavor per week and loved every one of them. In August, I had to buy a birthday gift for one of my longtime good friends. She loves margaritas and years ago, we used to have a standing monthly outing at a restaurant known for great margaritas. 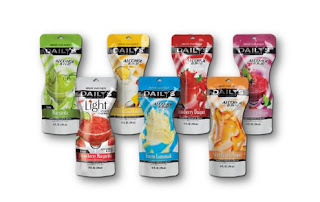 So I decided that her gift this year would be one of each flavor of Daily's Frozen Pouches. When she opened the gift, she could not wait to put them in her freezer to try them out. When I asked her which was her favorite, she said they were all great. I knew if she liked them, then the really must be good. Savor the Flavor with Daily's Cocktails! Daily's Frozen Pouches—America's Original Frozen Pouches—go right from the store to the freezer and come out as something truly unique. And, the alcohol is in the bag, which means no-hassle, blender-style cocktails in seven delicious flavors are as easy as Freeze, Squeeze and Enjoy! 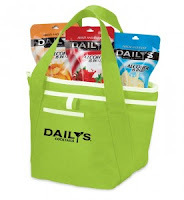 In addition to the 5 flavors that I have tried, Daily's Cocktails Frozen Pouches are also available in Pomegranate, and Light Strawberry Margarita. So although Summer is officially over, it can feel like Summer all year long with Daily. 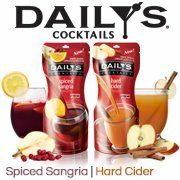 But just for Fall, Daily's has two exciting and delicious seasonal flavors making their way to shelves: Hard Cider and Spiced Sangria! Daily’s Spiced Sangria is made with red wine infused with oranges, pears, cranberry and a sprinkling of holiday spices. Daily’s Hard Cider will satisfy apple lovers everywhere with intense natural apple flavor and just the right amount of cinnamon and seasonal spices. Daily’s Cocktails Frozen Pouches are available a Walmart, Kroger, and Target stores that sell alcohol. And they range in price from $1.99 to $2.99 per pouch depending the store where you buy them. The regular price at my local Target is $1.99 per pouch and I have also seen them on sale at Kroger stores for $1.99. 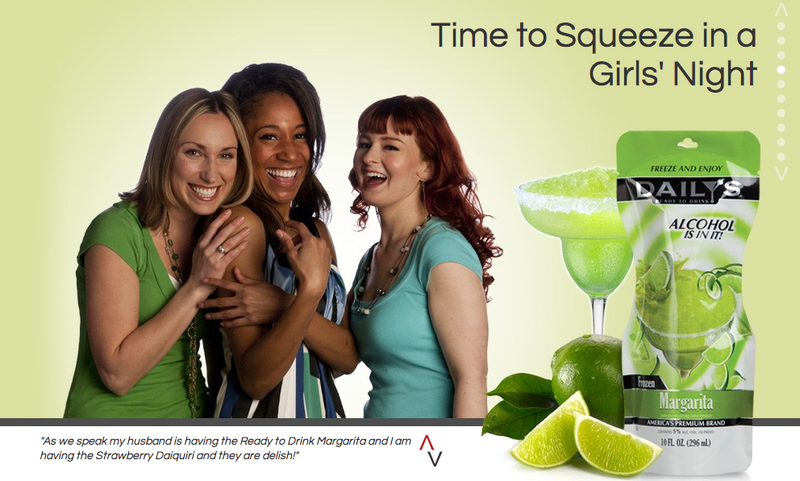 So you don't have to spend a lot to have some yummy cocktails right in your own home. Not when you can just buy Daily's Frozen Pouches. And remember, if you drink, never drive. Just stay home and enjoy. Be sure to check out Daily’s on Facebook, Twitter, and Pinterest to get the latest news from Daily’s including the introduction of new flavors! Three (3) FREEISMYLIFE readers will each WIN a Daily's Insulated Lunch Tote to keep all your frozen food items nice and cold - HOLLA to the FREE!!! - One entry form per person please. Duplicate entry forms will be removed. - You must be 21 years old or older to enter this giveaway. - USA addresses only. No P.O. Boxes. - The contest ends on Friday, September 28, 2012 at 11:59 am EST. - Three winners will be selected by random number generation. - Prize will be fulfilled to winners by Daily's Cocktails or their PR company. - You can get 1 extra giveaway entry for following Daily's Cocktails on Facebook. - You can get 1 extra giveaway entry for following Energizer on Twitter. - You can get 1 extra giveaway entry for following Daily's Cocktails on Pinterest. 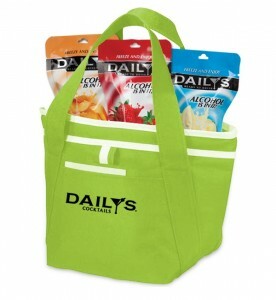 - You can get 1 extra giveaway entry for tweeting the following message on Twitter "I entered the @DailysCocktails Insulated Lunch Tote GIVEAWAY on @FREEISMYLIFE http://ow.ly/dUUEA "
Disclosure: I received a Walmart Gift Card from Daily's Cocktails so that I could buy Daily's Frozen Pouches at my local store. Daily's is sponsoring the giveaway in the post. All opinions are my own.